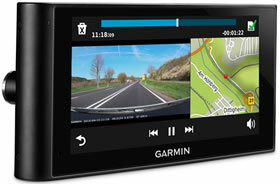 Garmin nuviCam LMT-D car sat nav features both a navigation and a dashboard camera (dash cam). The nuviCam satnav includes European navigation for UK and Europe which are free to update for the lifetime of the nuviCam LMT-D. The dashboard camera records in High Definition, features a G-Sensor for protecting video when a G-Force is detected and GPS saves the GPS location of incidents that occur. The satnav dashcam includes a 4GB microSD card in the box. Digital Traffic is free for the lifetime of the nuviCam and it provides delay times and possible detours. The nuviCam LMT-D is equipped with Bluetooth so you can connect with a Smartphone and make and receive handsfree calls. Garmin nuviCam LMT-D has been discontinued. Accessories, spares and parts are still available for your nuviCam LMT-D, as are the road maps. 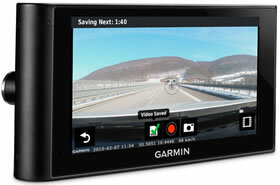 Garmin nuviCam LMT-D is a sat nav and dash cam all-in-one device. The nuviCam features a large 6 inch touchscreen and on screen information includes speed limits for almost every road, current speed, current street and arrival time. Directions to your destination will include spoken street names making it easier and simpler to navigate. The dash cam will record continuously and you can also use the nuviCam as a camera to take photos using the built-in battery that lasts up to 30 minutes. Full Europe Maps are included with the Garmin NuviCam which are free to update for the lifetime of the Garmin nuvi cam device. The latest points of interest (POI's) are also included free for the lifetime of the product. Further points of interest include speed camera locations supplied by Cyclops to warn you of speed cameras. The Garmin nuviCam also includes driver awareness features including forward collision warning if you are driving too close to the vehicle in front. The dashboard camera in the nuviCam records in HD continuously and there is a 4GB microSD card included in the box. There is also a G-Sensor built-in to detect G-Forces. If a major G-Force is detected such as an impact or heavy braking then the Garmin nuviCam will save the recorded video to protect it from being overwritten. The GPS capabilities of the Garmin nuviCam will also record GPS location of incidents. Digital traffic information is included with the Garmin nuviCam LMT-D. The traffic information will tell you the expected time of the delay and if there is an alternative route you will also be provided with a detour. 1. Download speed camera database directly from Garmin for £16.99 for a year (UK and Ireland) or £25.99 for a year (Europe). Updates are available every 2 weeks to download from a PC computer to your nuviCam. 2. Use a smartphone to get speed camera database. There is a one-off charge of £16.95 for life and the app streams speed camera locations database from your smartphone to your Garmin nuviCam. Bluetooth will syncronise the Garmin nuviCam with your smartphone then you can use the speaker and microphone on your Garmin nuviCam to make and receive handsfree calls. Furthermore, when connected to your smartphone, you can use premium data services and get additional real-time information such as such the weather radar images by using the Garmin Link App. Voice activated navigation is included with the Garmin nuviCam LMT-D. Lane Guidance at each junction tells you on the screen which lane you should be in at each junction. The Garmin nuviCam will also displays actual real road signs on the nuviCam screen. Birds Eye junction view will also provide a view overhead of each junction. Points of Interest (POIs) include restaurants and shops plus the nuviCam will inform you of nearby POI's along your journey such as food, fuel and ATMs. Garmin Real Vision feature will switch the Garmin satnav from map mode to video recording displayed on screen to show you where your destination is. There is a 4GB microSD card included in the box for recording and saving video recorded using the dashboard camera. 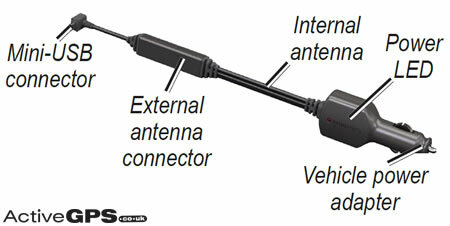 A magnetic amount is also provided for quick installation of the nuviCam satnav and dashboard camera. The Garmin nuviCam LMT-D includes everything you need to mount and install it in your car. Included when you purchase from ActiveGPS is a windscreen suction cup mount which is magnetic to make installing and dismounting your dezlCam simple, quick and easy. 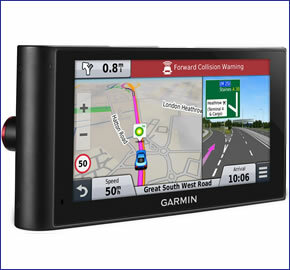 Garmin nuviCam LMT-D is preloaded with City Navigator NT for the UK, Ireland, Western and Eastern Europe provided by here maps. These maps can be updated FREE for the life of the product, when you register your nuviCam with Garmin UK. Further Garmin nuviCam maps are available on SD card which insert directly into the Garmin nuviCam. Available Garmin nuviCam maps include North America, Australia and New Zealand, Middle East and Southeast Asia. Click here. The Garmin nuviCam LMT-D includes all the accessories you need to get you up and running. Many additional parts are also available including a carrying case, replacement magnetic mount, portable mount and vehicle reversing camera. The Garmin nuviCam is preloaded with street-level road maps for all of Europe. If however, you want to take the nuviCam further afield, we may have the map that you need. Garmin City Navigator maps available include: USA, Canada and Mexico, Australia and New Zealand, Morocco and Southern Africa. Question: I own a Garmin nuviCam lmt-d sat nav and need a power cable that will work with it both to charge and use for the live traffic. Can you tell me if the ta20 unit you sell will do this please? Answer: The TA20 while providing power to your Garmin nuviCam LMT-D will NOT provide traffic information. You can view and purchase all Garmin nuviCam LMT-D compatible accessories online here. Question: I have just bought a Garmin NuviCam from Halfords before coming across your website. On opening the box to see not mag mount and camera is mounted in centre. Do they do a mag mount because of the centre mounting camera? I thought the camera was mounted on the left as seen on YouTube, any suggestion please thank you? Answer: The Garmin nuvicam has been discontinued. We do not know what parts are included by Halfords, or whether it is the original nuvicam LMT-D – sometimes Halfords have an exclusive version with different specifications. We do sell a complete range of genuine Garmin nuvicam LMT-D accessories. Question: How does the NuviCam work with the friction mount when the suction mount is needed for connection? Answer: Yes, you can use the Garmin nuviCam with the Portable Friction Mount (pictured right). To connect the two you will also need to either already have or purchase separately the nuviCam cradle, which is supplied with the Garmin nuviCam Suction Cup and Magnetic Mount. These accessories along with a complete list of available parts for the Garmin nuviCam can be viewed here. Question: If I buy the new Garmin Nuvicam with integral dash cam and want to add a reversing camera switched through the reversing lights,will the part no 010-12242-23 give me what I need or do I need the one with the receiver, part number 010-12242-00? Part number 010-12242-23, is to add an 'additional camera' to part number 010-12242-00 and does NOT include all of the necessary cables to connect the BC 30 camera and the nuviCam sat nav together. Do you have a question about the Garmin nuviCam? Submit your question via our contact page.